Mexico: Ochoa; Rodriguez, Marquez, Moreno, Layun, Aguilar; Guardado, Herrera, Vazquez; Dos Santos, Peralta. Cameroon: Itandje; Assou-Ekotto, Nkoulou, Mbia, Chedjou; Djeugoue, Enoh Song; Moukandjo, Choupo Moting; Eto’o. Mexico have beaten Cameroon 1-0 in a rain-drenched Natal but the World Cup match was once again scarred by more refereeing blunders. Mexico enjoyed greater possession, and had to overcome the frustration of two disallowed first-half goals, a stubborn opponent and torrential rain to earn three vital points in Group A.The rain was relentless, descending in thick sheets to turn this city’s glistening new soccer stadium into an overstuffed water park. Many in the stands did not seem to mind. The crowd was crammed with expectant Mexico supporters, who had traveled to Natal in huge numbers and were percolating in team colors through the city’s beachside pubs and restaurants during the week. Cameroonian midfielder Eyong Enoh said it felt like the game was taking place in Mexico, and the play reflected that. 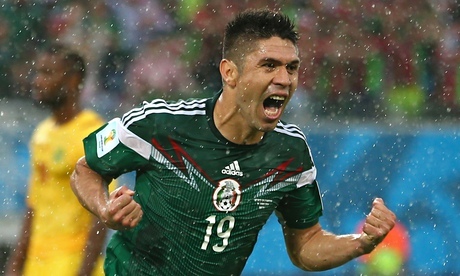 Fans yelled “Olé!” as Mexico tapped the ball around the sodden field. Mexico’s wingbacks, Layún and Paul Aguilar, took advantage of the considerable space Cameroon’s defense conceded to them. In Miguel Herrera’s system, the two essentially become attacking midfielders in transition. Cameroon, save for a brief bright stretch midway through the first half and a few desperate runs in the final minutes, looked toothless. Cameroon have now lost five #WorldCup games in a row, the longest ever losing streak by an African team. Gloom. Oribe Peralta grabbed the only goal after 61 minutes but Mexico will consider themselves unlucky not to have been more comfortable winners after Giovani Dos Santos had two goals ruled out for dubious offside decisions in the first-half. In the 11th minute, the Villarreal player found the target with a sweet, stabbed volley from a cross by Porto’s Hector Herrara but his effort was ruled out for being offside. On the 30-minute mark, a Dos Santos header from a corner by Miguel Layun was also not allowed to stand. In between, Cameroon skipper Samuel Eto’o had a goal chalked off for offside, although this time the referee made the right decision. The blunders came just a day after Japanese referee Yuichi Nishimura controversially awarded a penalty which set Brazil on their way to a 3-1 win over Croatia. The one thing to worry about for Mexico is the two blown offside calls. Goal differential could easily be a factor in Group A.
Peralta deservedly put Mexico in front just after the hour mark. Dos Santos’s shot was parried into his path and the Club Santos Laguna striker slotted in from close range. Cameroon’s Benjamin Moukandjo had a chance to rescue a point in injury time but his header was well-saved by Guillermo Ochoa. 11′ Kitchen Sink Or Caution? It was the team’s best performance under Herrera, who was named as coach late last year, and a hugely important win for the players, who want to put the embarrassment of their erratic qualification campaign behind them and advance this summer to what their fans often refer to as the World Cup’s “fifth game.” In each of the past five World Cups, the team has been eliminated after four games, in the Round of 16, creating a frustrating pattern. Mexico will now play host nation Brazil on June 17 in Fortaleza, while Cameroon will travel to Manaus to play Croatia June 18.